The Eastern Counties Women's squad travelled north to play Durham County Women in a warm up game ahead of the 2018/19 Gill Burns Division 2 Championship campaign which commences on the 27th April with an away fixture against Hertfordshire. With an early start and long coach journey it wasn't surprising that it took some time for EC Women to get into their stride, Durham County on the other hand came out of the blocks firing on all cylinders and used their forwards to great effect before shipping the ball to their impressive wings, one of whom scored an early try to take a narrow 5-0 lead. EC Women rallied however and got their defensive lines sorted, debutant Jodie Turl to the fore tackling like a back-row player from tight head, supported well by fellow front row player Carmel Leak who carried extremely well throughout the game. Leak scored the first try just before the half time break, powering over the line to score following a series of surges, with Robyn Gordon adding the conversion to take EC Women into a narrow lead at half time. EC Women started the second half in determined fashion, Sophia John making big holes in the Durham defences and it wasn’t long before EC Women were on the score sheet again shortly after the break, this time through scrum half Georgie Palmer who sniffed a gap and sprinted through to score an unconverted try to take the lead to 5-12. Shortly after EC Women scored again, this time through Elina Rougier, the fly half spotting that the blind side was unguarded stepped past the defence before scorching down the wing to score a fine individual try wide out on the right flank, a strong wind meaning Gordon couldn't add the conversion so the lead was 5-19. 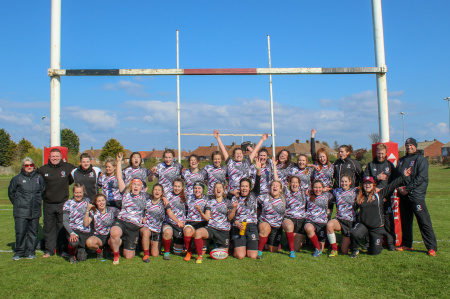 EC Women's final try came from Palmer bagged her second try having seen that the home-side had left the breakdown unguarded allowing her to snipe then sprint for the line scoring under the posts, Gordon added the extras to take a commanding 5-24 lead. The EC Women's players thinking they had the game sewn up began to relax, leaving holes in an otherwise solid defence and allowed the home-side to score two quick tries to narrow the lead to 17-24. However, EC Women dug in and closed down any further scoring opportunities, closing out the game to seal their first victory of the 2018/19 campaign.